The integrated crew management software of CODie provides a full scale crewing system for shipping companies and crew agencies. 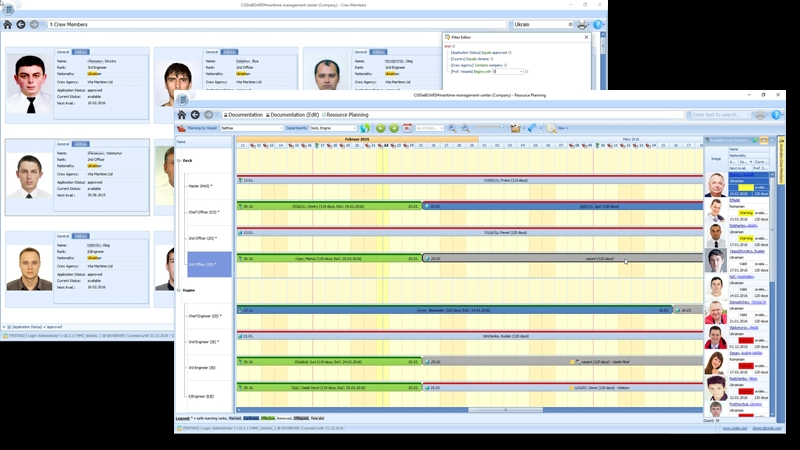 It helps your crew managers to easily plan manning by utilizing the visual resource planners - featuring drag&drop functions and automatic crew suggestions for open vacancies. Furthermore crew member data, certs and contracts are managed by the maritime-management-center, which offers in addition a gross payroll module. Our aim is to support your crewing department by offering smart ways to work and to allow maximal customization of the software. For example is the crew member overview available as common table or as business card view, both can be fully customized. Another highlight is our extended search and filter functions which allows you to use logical commands and to safe filter settings, thus you search fast and easy. Crewing department can further create their own reports as a comprehensive report designer is included, therefore it is able to safe created reports and to use any data field within the database.